With the establishment of your new group, you'll be appearing in a stage-play and releasing a CD. So have you heard anything from your Kenshuusei senpai who have already made their debut? Hamaura: Takagi Sayuki-chan sent me a congratulatory message. She wrote quite a long message, which made me happy. She wrote all sorts of things, giving me things like advice and so on. And she also said that she was glad that Tagucchi (Taguchi Natsumi) and Rena and I got into a new unit. Did Tsugunaga Momoko-senpai, whom you admire, say anything? Hamaura: Tsugunaga-san just happened to be next to me at the Hello! Con rehearsals. She told me that it made her so happy that she felt like crying! Besides that, Ikuta Erina-san, Makino Maria-chan, Sasaki Rikako-chan, Fukumura Mizuki-san...... they all wished me congratulations! Did the other Kenshuusei say anything? Hamaura: Many of the Kenshuusei girls cried... I think that those were tears of frustration. It really is frustrating to not get picked. Hmm? Were they told on a different day, not on the day you got the surprise announcement [that you would be part of a new unit]? A brutal contrast. Since all Kenshuusei are aiming for a debut. If that's the case, do you think of the other members as rivals that you have triumph over? Or comrades-in-arms? Hamaura: The basics of the Kenshuusei is that the senpai teach the kouhai. So we may be rivals, but we're also close comrades that can teach one another as well. Even in this group, Taguchi Natsumi-chan and I have spent the longest time as Kenshuusei. So I think that we have a role to teach the rest as well. Not just singing and dancing, but also common courtesy. Not that I'm good at teaching, but I've got to work hard at that. I still remember the tiny little Hamaura-san. Hamaura: I became a senpai in the blink of eye. I was still very much a kid when I joined, and I hadn't thought about making my debut at all. Back then, I was just giving it my all in order to not be left behind by the senpai. But then, the senpais left in a stroke, and before I knew it, I was the most senior. How did you feel when you saw your kouhai make their debut before you? Hamaura: Of course I felt frustrated. 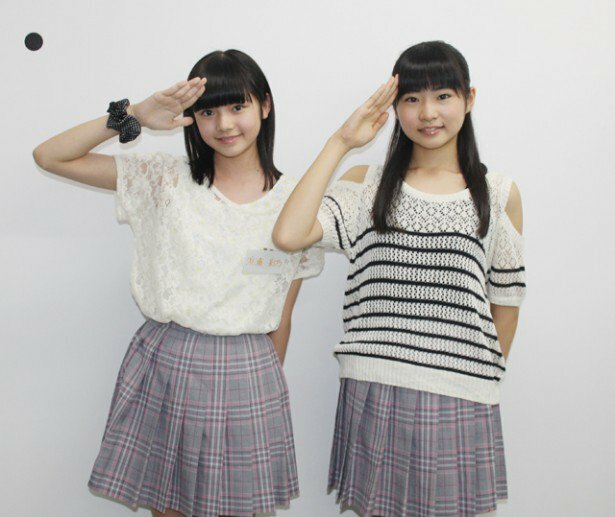 However, be it Uemura Akari-chan or Kanazawa Tomoko-chan, their performing ability has soared ever since they entered Juice=Juice. They're not the two that I used to know when we did the occasional performance together at the Nama Tamago Shows! Honestly speaking, Uemura Akari-chan wasn't that comfortable with singing back then, but now she's really good...... She's even better than me. It's good motivation. Are there any Kenshuusei that you've got your hopes up for in the future? Hamaura: Kaga Kaede-chan! Besides that, Kishimoto Yumeno-chan! The two of them are pretty level-headed, and I hope that they'll take the lead. Any hopes for your member colour? Hamaura: Pink or orange. Pink is Tsugunaga-san's colour, and I personally really like it as well. However, I really like orange as well. Orange is a colour that really lifts your spirits when you look at it, isn't it? So I like it. Tsugunaga-san's name has been coming out everywhere. What do you respect about Tsugunaga-san? Hamaura: She's a quick-thinker, and her singing and dancing are perfect. Her quick wits in particular, it's something that can't be mimicked. I'm really amazed by how she's able to respond to anything. You have teachers for dancing and teaching, but how do you practise talking? Hamaura: I make notes. I write an assembly of words on paper, and figure what simple words I could add in to make it easier to convey, that's how I do my research. While it's possible to not use a notebook and do it on a mobile phone, somehow or the other, if I don't write it down in words, I end up being unable to figure out what I'm talking about. Who's there, where it is, what I'll do, what other people are doing...... I also include those elements when I write out my sentences, then I have someone like my older sister take a look at it. I ask if they understand what it means. If I'm told that it doesn't make sense, I fix it. That's amazing! You put together what you want to talk about by establishing it logically and systematically. Hamaura: Yes. I really learnt a lot when I got to follow ℃-ute-san on their concert. And of course, I learn from Tsugunaga-san's talking as well. Your new group is just getting started. Frankly speaking, what sort of group would you like to be in the future? Hamaura: I'd like to become the liveliest group in Hello! Project! Colour-wise, we'd be something bright like yellow. And I also feel like I'd like each and every one of us to fully bring out our individual characteristics.